Yesterday evening President Trump tweeted a video, made by a supporter, which used music from 'The Dark Knight' soundtrack. Warner Bros. wasn't pleased with this unauthorized reproduction and asked Twitter to take it down, which it did. While this may seem like an isolated incident, President Trump has made similar mistakes in the past, to which rightsholders are paying extra close attention. When President Trump took office in early 2017, copyright holders hoped to have found a new ally in their fight against piracy. The Copyright Alliance made this very clear in a public letter stressing that few presidents, if any, have had a more sizable and diverse copyright portfolio. In the two years that followed not a whole lot has changed in terms of U.S. copyright policies. However, Trump himself has made headlines on a few occasions, being accused of copyright infringement. This happened again yesterday when the US President posted, what many believed to be, a 2020 campaign video on Twitter. “MAKE AMERICA GREAT AGAIN!” Trump’s tweet reads, with the video made up of a variety of news clips underneath. The video in question has been floating around on YouTube for a few days and doesn’t appear to come from the White House, as some suggested. In fact, it was posted by a Reddit user “knock-nevisTDF,” last week, who says he made the clip himself. The President appeared to like it though and was happy to share it via Twitter. However, what he may not have realized is that the video in question was set to music from “The Dark Knight Rises”, something that wasn’t well received by Warner Bros. Entertainment. Shortly after this statement, Twitter did indeed take the video down, as can be seen below. The copy that was posted on YouTube and shared on Reddit has been removed as well, although it remains available elsewhere. 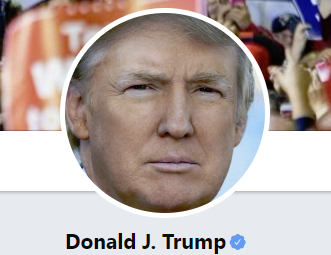 The reality is, however, that this isn’t the first time the President has been called out for sharing copyright-infringing content on Twitter. Just a few weeks ago, a video the R.E.M’s song, ‘Everybody Hurts,’ in the background, was removed by Twitter. Twitter reportedly took this action after Mike Mills, the bassist for R.E.M., complained about the unauthorized use of the track. And just last week Electronic Arts reported one of President Trump’s tweets for using copyrighted audio from a Mass Effect 2 game trailer without permission. That is now ‘withheld’ from the public. And that’s not all. There is also a copyright claim on a tweet about a beautiful evening in El Paso, posted a few weeks ago. While more detail is not available, we assume that the President used copyrighted material without permission, again. If that’s not enough, there are trademark issues as well. 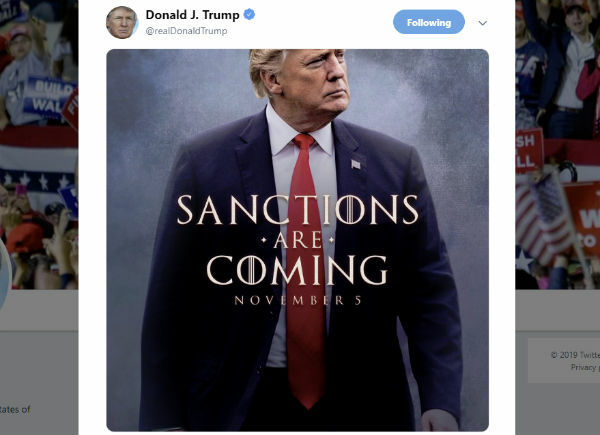 HBO didn’t like it when President Trump used a photo containing the Game of Thrones font and a play on the “Winter is Coming” message in a political context. The company said in a statement that it “would prefer our trademark not be misappropriated for political purposes,” hinting at trademark misuse, but it’s unclear whether it took any action in response. For now, none of the complaints are affecting the status of President Trump’s Twitter account. In theory, Twitter reserves the right to suspend accounts that repeatedly receive copyright complaints. This is clearly stated in the company’s copyright policy. “If multiple copyright complaints are received Twitter may lock accounts or take other actions to warn repeat violators. These warnings may vary across Twitter’s services. Under appropriate circumstances we may suspend user accounts under our repeat infringer policy,” the policy reads. How many “offenses” are needed to warrant a suspension is not mentioned, however. Finally, it’s worth noting that the “Dark Knight Rises” score, titled “Why Do We Fall?” was composed by Hans Zimmer. He previously shared the track on his YouTube account, but the video in question was recently removed, likely by himself. That said, the same music is used in hundreds if not thousands of other YouTube videos, and it’s widely shared on Twitter as well. Apparently, copyright takedowns have priority when the President is involved.